Like shortly after WWII, Canada is now looking to increase its international presence by shopping around the world for locations to setup military bases, much like we had in Germany after WWII and as part of the beginning and middle of the Cold War. Unlike with McKay's plan, Canadian forces in Germany are scaled back from what they used to be. 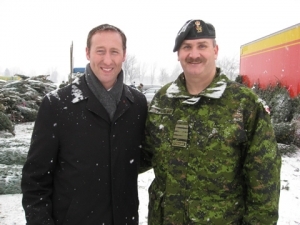 Defence Minister Peter MacKay confirmed today that Canada is now seriously considering expanding the military beyond Canada in a bid to increase Canada's presence on the international stage. "We are constantly working within that paradigm of countries, to see where we can bring that niche capability to bear. It's part of planning and preparation, in conjunction with our equipment needs," said MacKay with regards to the fact that Canada is a popular choice as peacekeepers and a relief force at the UN. Although Canada did have a base in the United Arab Emirates called 'Camp Mirage', they were kicked out because of a dispute over commercial landing rights for the airline Emirates on Canadian soil. After being tossed out of the UAE, Canada was forced to setup a makeshift base on the island of Cyprus. "The focus of the planning, let's be clear, is our capability for expeditionary participation in international missions.... We are big players in NATO. We're a country that has become a go-to nation in response to situations like what we're seeing in Libya, what we saw in Haiti..."
Canada believes it has an international responsibility to assist populations in events like the Haiti earthquake or the civil uprising in Libya and takes pride in its involvement in humanitarian missions. Future bases outside of Canada could help us in assisting our troops stationed around the world or supporting allies in armed conflicts. International bases could also help Canada in its mission in Afghanistan by providing an interim point for delivery of troops and supplies. The existence of bases makes complete logistical sense in that it increases speed in which the government can deploy troops. The Canadian Forces are reportedly in talks with Kuwait, Kenya, South Korea and Singapore. They has also reportedly concluded negotiations with Jamaica and Germany to setup what the Forces call "Operational Support Hubs".